Here are the top 30 bestselling activities, crafts & games books for 6 year olds. Please click Read Review to read book reviews on Amazon. You can also click Find in Library to check book availability at your local library. If the default library is not correct, please follow Change Local Library to reset it. 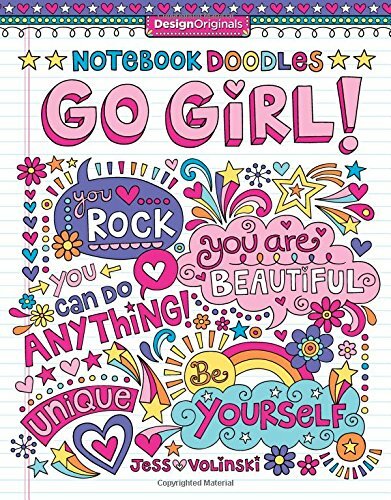 Notebook Doodles Go Girl! is not just another kid’s coloring book! 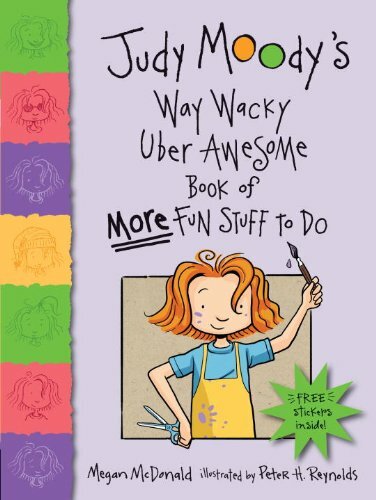 It is designed specifically for the design-savvy TWEEN who thinks kids books are too juvenile and mom’s adult coloring books are too, well…adult! 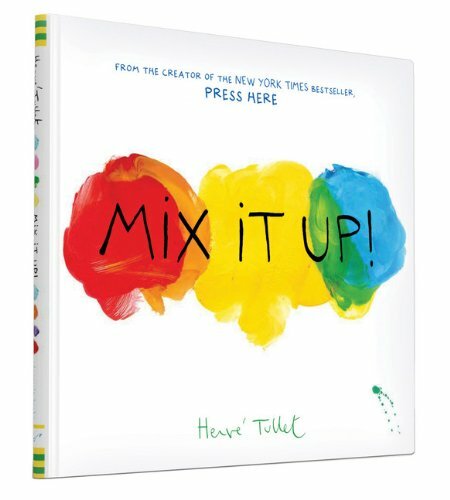 Inside this book, youthful readers will discover 30 interactive art activities that are just waiting to be filled with color. They will also find a coloring art lesson, 20 inspiring color palettes, 8 pages of colored examples, and inspiring quotes to go with every design. Watercolors, colored pencils, markers, crayons, and gel pens will all look stunning on high-quality, extra-thick paper. Each page is perforated, so when it’s finished, it can easily be removed to hang up or give as a gift. 365 Things to Do with LEGO® Bricks inspires you to look at your LEGO bricks in new and exciting ways. This interactive book features imaginative play and building ideas, from LEGO projects that take just a few minutes and require a handful of bricks to inspirational build ideas and activities to keep you occupied for hours. Visual tips and advice from LEGO fan builders will encourage you to get creative and have fun while learning new building skills such as building your own LEGO pet, challenging your friends to make the tallest LEGO tower against the clock, and creating a LEGO treasure hunt. 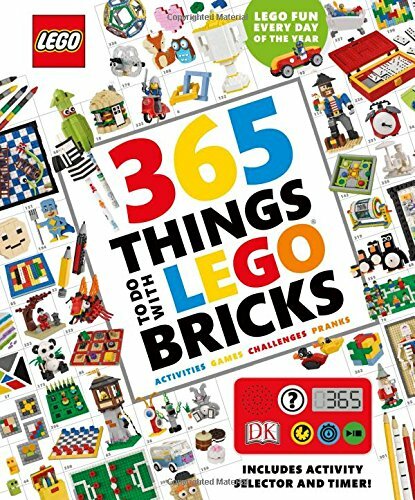 Featuring a timer and random number generator for selecting activities, 365 Things to Do with LEGO Bricks is full of games and activities that will keep you busy every day of the year. LEGO, the LEGO logo, the Brick and Knob configurations and the Minifigure are trademarks of the LEGO Group. ©2016 The LEGO Group. All rights reserved. LEGO, the LEGO logo, the Brick and Knob configurations and the Minifigure are trademarks of the LEGO Group. ©2015 The LEGO Group. 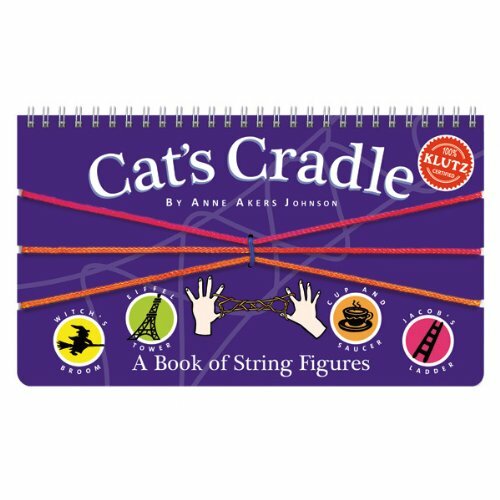 KLUTZ-Cat’s Cradle Kit features five different string figures that are clearly illustrated. Attached to the book is a tie-dyed string loop so all you need to bring is ten fingers. Projects include Jacob’s Ladder Eiffel Tower Witch’s Broom and more! Recommended for ages 6 and up. Spiral-bound: 36 pages. Made in Korea. 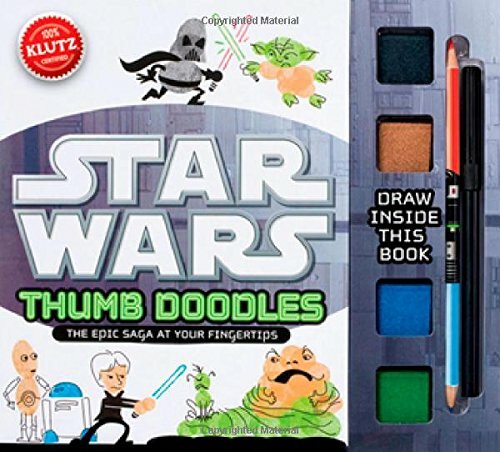 Want Star Wars® at your fingertips? Star Wars Thumb Doodles features four inkpads, markers, and a double-tipped colored pencil to make thumbprint versions of your favorite Star Wars characters. 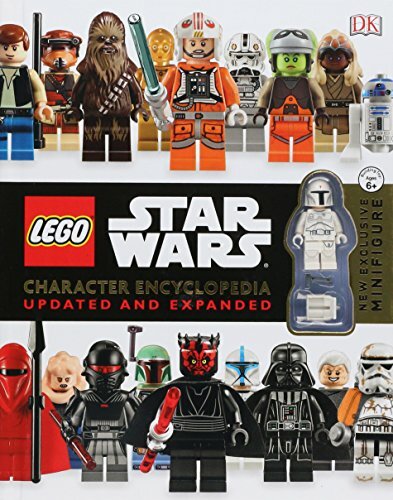 Simple step-by-steps include Princess Leia and Luke Skywalker, Clones and Battle Droids, Ewoks and Wookiees, Han Solo and Jabba the Hut. Using ink art and a few quick lines, you can recreate favorite moments from the movies, or scenes never before seen before . . . even in a galaxy far, far away. Now an Amazon Best Kids’ Books of 2016 pick! Balancing your child’s screen time can be difficult, especially when it comes to wildly popular, open-ended video games like Minecraft. Minecraft offers players an environment focused on exploration, imagination, and creation, but its nonlinear game structure can mean spending a lot of time in the game. 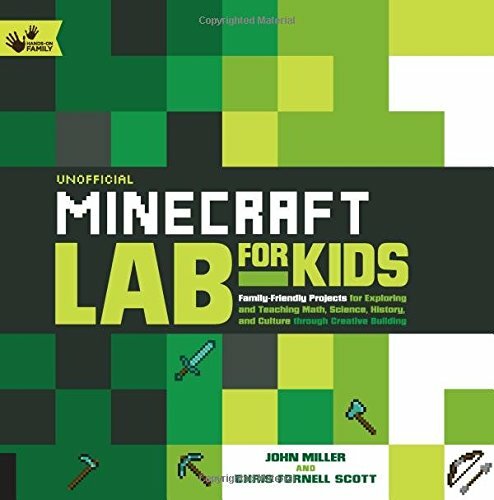 Unofficial Minecraft Lab for Kids includes a variety of creative exercises that explore the game’s aspects and uses them to teach fun, educational lessons. You will start the book by brushing up on some common Minecraft language and examining each of the four game modes: survival, creative, adventure, and spectator. Then, you’ll use this knowledge to venture off onto the six different quests that encourage child and adult participation. These “gamified” labs will allow your child to earn stickers and badges as rewards as they complete quests. You’ll even learn how to screencast and narrate your own videos to share with family and friends! Unofficial Minecraft Lab for Kids provides a fun, educational gaming goals that you and your child can reach together! 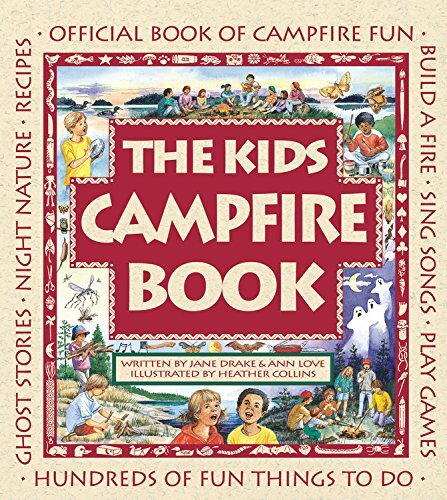 This book in the Family Fun series has everything you need to know about having a fun and safe campfire. This collection of outdoor activities, games, stories, songs and more is for kids and families to share around the campfire. It includes tips on how to find the best campfire site, identify animal cries at night and locate constellations. Kids will also find out how to make pizza over an open fire, tell a spooky ghost story, or create musical instruments for a sing-along. With more than 125 pages of fun things to do around a campfire, this is the perfect book for every camper, canoeist and camp counsellor! Make striking, classic origami designs with this easy origami kit. 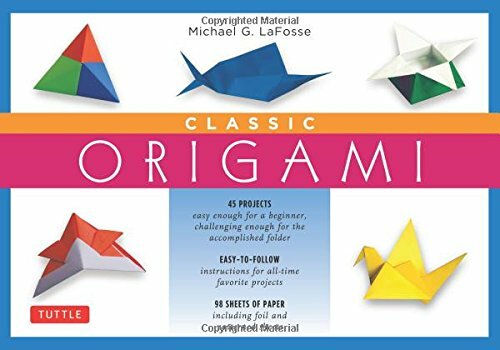 From world renowned origami artist, Michael LaFosse, comes this affordable collection of classic origami paper craft projects featuring traditional designs as well as a few new twists on old favorites. Perfect for beginning origami folders or more experienced folders, Classic Origami Kit includes everything needed to get folding quickly. This unique collection of origami designs will help you create folded paper models of all the classic origami projects. Use it to craft eye-catching origami for your friends, to beautify your home—or as a wonderful gift for origami lovers. All of the folds are simple enough to be origami-for-kids projects and are a great way to learn origami. The origami paper in the kit already has colors so no paint or glue is required, just unpack and start folding right away! Classic Origami Kit provides you this stunning collection of origami projects that will have you creating your own personal origami studio in no time! 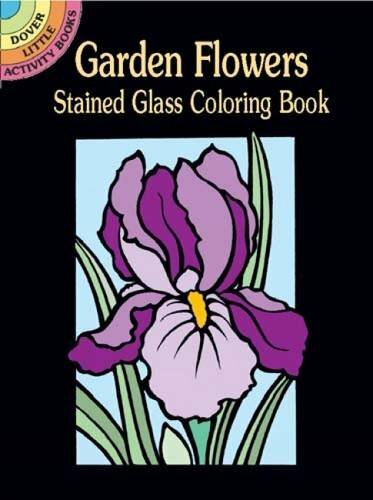 Youngsters can create a brilliant bouquet of garden flowers by coloring drawings of cone flowers, sweet William, columbines, irises, fuchsia, pansies, and cosmos. To color, use felt-tip pens, crayons, paints, or other media and place near a source of bright light for glowing effects. Of all of nature’s wonders, snowflakes are among the most intriguing. 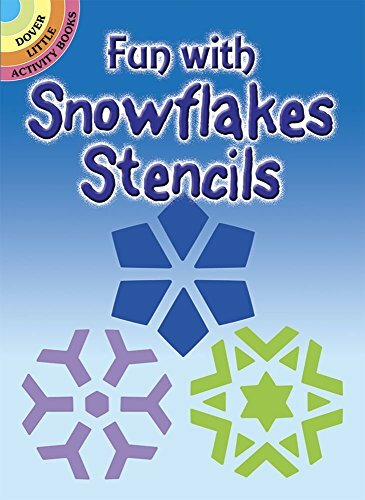 Now anyone can create an enchanting winter wonderland simply by repeating these stencil outlines for 6 lacy snowflakes. Perfect for window decorations, greeting cards, posters, and more, these lovely designs will fascinate young and old alike. This interactive book introduces young children to the intriguing world of dinosaurs. Vibrantly illustrated background, stickers, and punch-outs come together to provide hours of imaginative fun. The background scenery, a stand-up panorama of a prehistoric land, doubles as a stickering page and a vivid background for punch-out playtime. 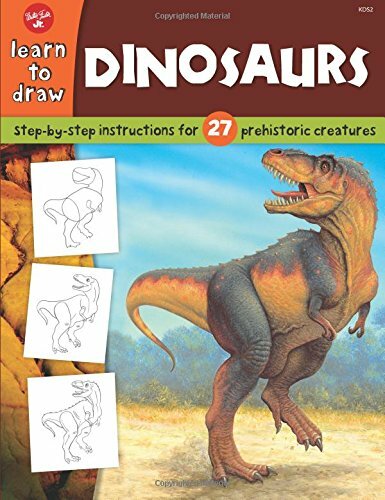 The sturdy punch-outs are perfectly sized for little hands, and include multiple different dinosaurs, prehistoric plants and trees. Reusable stickers include flying dinosaurs, land-roaming dinosaurs, rocks, trees, dinosaur footprints, and more. All together, Sticker, Punch-out & Play! : Dinosaurs makes for interactive play and limitless fun. Make colorful and fun origami animals with this easy origami kit. Fogs, butterflies, seals and dogs are just a few of the gorgeous origami animals you can create with this paper craft origami kit. 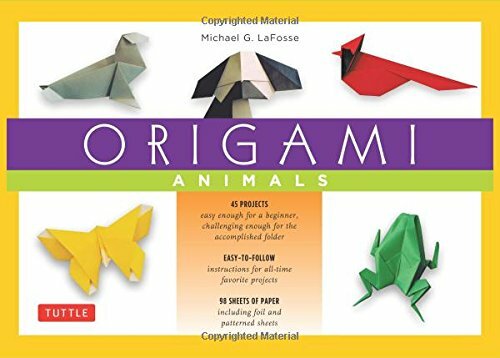 From world renowned origami artist, Michael LaFosse, comes this essential collection of animal paper craft projects. Perfect for folders of all skill level, Origami Animals Kit is the affordable easy-to-follow solution for everything needed to get started on traditional animal origami designs as well as new twists on old favorites. This unique collection of origami designs will help you create folded paper models of animals from around the world. Use it to craft eye-catching origami for your friends, to beautify your home—or as a wonderful gift for animal lovers. All of the folds are simple enough to be origami-for-kids projects and are a great way to learn origami. The origami paper in the kit already has colors so no paint or glue is required, just unpack and start folding right away! Origami Animals Kit provides you this stunning collection of origami projects that will have you creating your own personal zoo in no time! Just Puzzling! 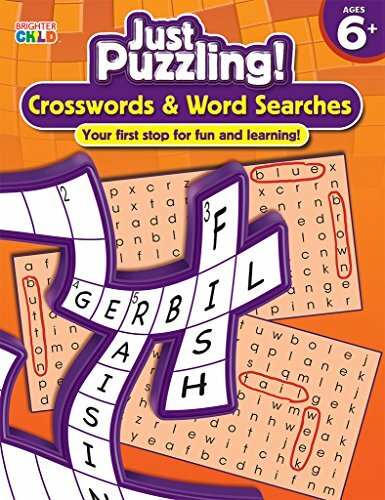 Crosswords & Word Searches is a fun and educational way to entertain your child anywhere he or she may go! This colorful activity book will provide your child with hours of entertainment and skill-building practice. The engaging, full-color activity pages reinforce the basics of reading and math, for children ages 6 and up, through crosswords and word searches. These challenging puzzles are designed to help your child master critical thinking skills and improve concentration. With fun and learning on every page, Just Puzzling! is a win-win for you and your child! –Answer key included. 96 pages. With the help of this easy-to-follow guide, young feline fanciers will find it’s a snap to create portraits of their furry friends. Simple step-by-step diagrams, incorporating a variety of circular, oval, and other shapes guide young artists along the way, demonstrating how to produce likenesses of 30 different subjects. The results are recognizable, accurately rendered pictures of cats and kittens in assorted poses: seated, stretching, preening, balanced on their hind legs, ready to pounce, and other positions. 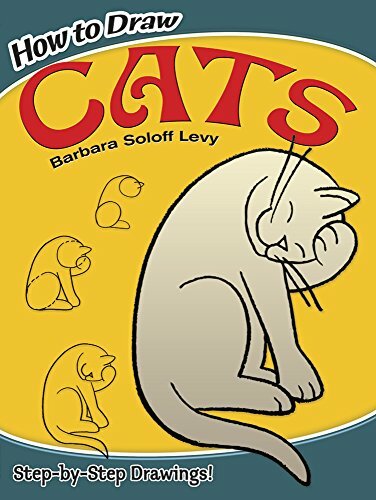 In addition to domesticated cats, this delightful, entertaining guide also shows how to create a lion, bobcat, cheetah, tiger, and other denizens of the wild. These engaging sketches are not only fun to draw, they’ll also help youngsters master the basics of developing shapes and proportions. Make origami monsters and mythical creatures with this easy origami kit. You’ll bring some of history’s most beloved and feared mythical creatures to life with this exciting collection of origami. These beginner and intermediate origami projects are perfect for children and adults with basic folding skills. They are ideal for party decorations, for gifts, or just for fun! World-renowned origami author and artist Michael LaFosse provides easy-to-follow instructions along with clear illustrations that will have you folding origami models in no time. Use it to craft eye-catching origami for your friends, to decorate your room or as a wonderful gift for mythology lovers. All of the folds are simple enough to be origami-for-kids projects and are a great way to learn origami. The origami paper in the kit already has printed patters so no paint or glue is required, just unpack and start folding right away! 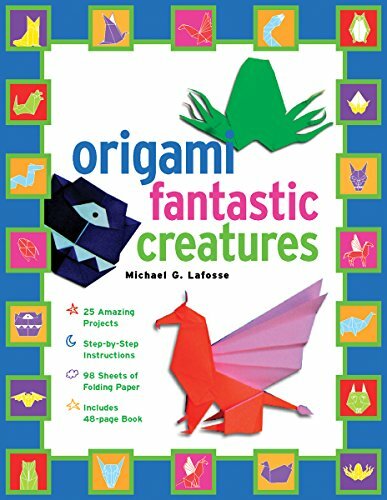 Origami Fantastic Creatures is perfect for both home and school craft projects—as well as a wonderful gift for fantasy lovers. Fresh from a fantasy garden, these 31 full-page patterns feature lush roses, dozens of daffodils, sprays of poppies, butterfly-bedizened sunflowers, and clusters of water lilies and dragonflies. Each illustration includes a fanciful floral border. Pages are perforated and printed on one side only for easy removal and display. 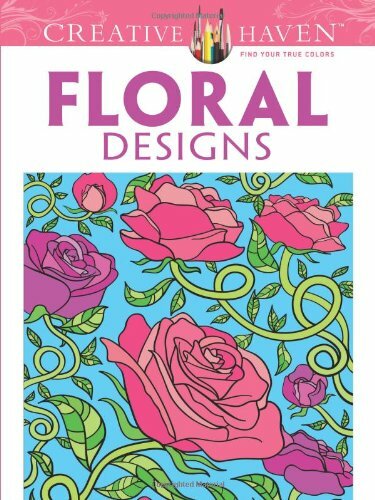 Specially designed for experienced colorists, Floral Designs and other Creative Haven® coloring books offer an escape to a world of inspiration and artistic fulfillment. 18. My Big Book of Christmas Coloring, Songs & Activities: Holiday games, puzzles & activities for kids of all ages! 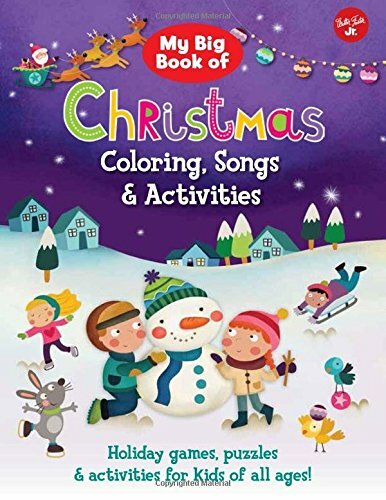 My Big Book of Christmas Coloring, Songs & Activities is filled with holiday games, puzzles, and activities for kids of all ages! From word searches and crossword puzzles to holiday songs and recipes, My Big Book of Christmas Coloring, Songs & Activities is filled with activities for kids of all ages! Packed with 96 pages of holiday-themed projects, this book will keep kids entertained for the twelve days of Christmas and beyond. With tons of bright and colorful illustrations and plenty of Christmas cheer, My Big Book of Christmas Coloring, Songs & Activities is the perfect gift for kids to help build the excitement for the upcoming holiday season. 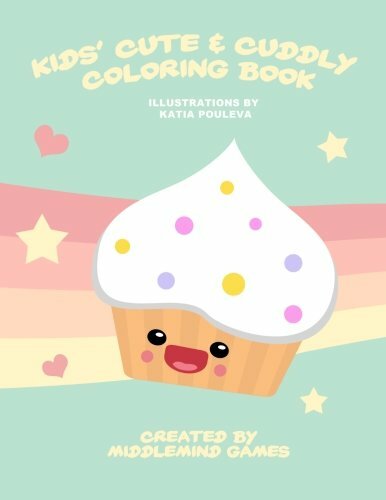 Kids’ Cute & Cuddly Coloring Book contains 60 adorable images ready for coloring. You won’t find a bigger, cuter coloring book anywhere else! Original illustrations by Katia Pouleva and co-created by Victor G. Brusca of Middlemind Games. Just Puzzling! 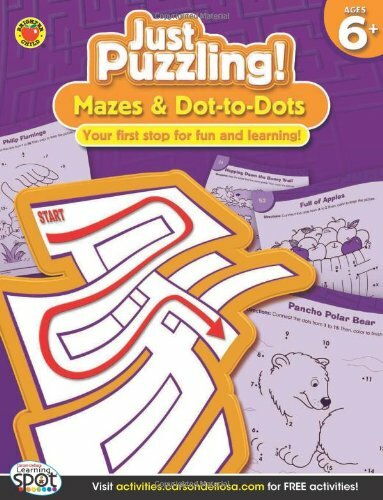 Mazes & Dot-to-Dots is a fun and educational way to entertain your child anywhere he or she may go! 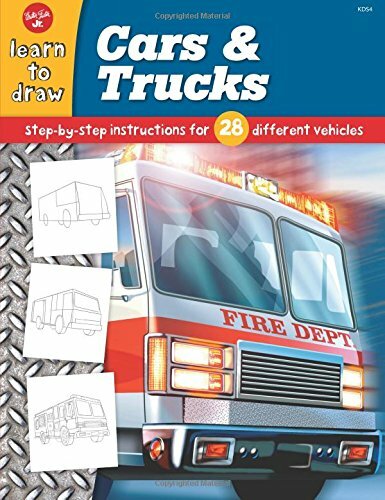 This colorful activity book will provide your child with hours of entertainment and skill-building practice. The engaging, full-color activity pages reinforce the basics of reading and math, for children ages 6 and up, through mazes and dot-to-dots. These challenging puzzles are designed to help your child master critical thinking skills and improve concentration. With fun and learning on every page, Just Puzzling! is a win-win for you and your child! –Answer key included. 96 pages. Treasure Hunter’s Handbook is for kids and families who love to explore the world around them! 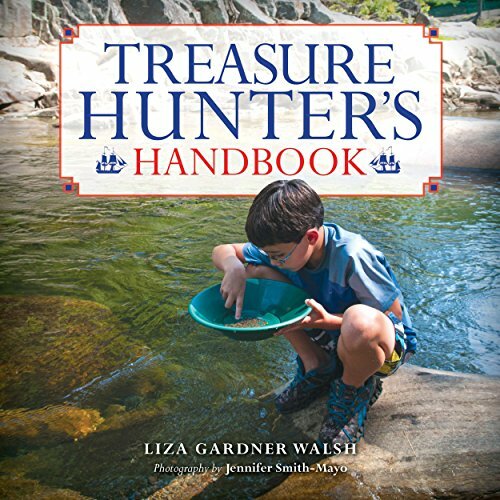 Treasure hunting is a fun family activity that encourages kids to get outside, and Gardner Walsh’s new book helps young explorers learn how to pan for gold, use metal detectors to find buried treasure, use GPS to do geocaching or letterboxing, and search for arrowheads and gemstones. Treasure Hunter’s Handbook also includes wonderful bits of pirate lore and some fun pirate/treasure-hunting craft activities. Ahoy, matey! Myths and legends of buried pirate treasure. Panning for gold: Panning for gold is making a comeback and is a great activity for kids. Mining for minerals and gemstones: Provides some information about how and where to find Maine’s famous tourmaline and other gems. Metal Detecting: Covers the basics of using a metal detector and tells some of the stories of amazing treasure found using this simple device. Geocaching and letter boxing: Geocaching is a real-world, outdoor treasure hunting activity using GPS-enabled devices. Letter boxing is a low tech version that combines navigational skills and rubber stamp artistry. Found treasures: Hunting for everyday treasures such as sea glass, sea shells, four-leaf clovers, arrowheads, and fossils. 22. 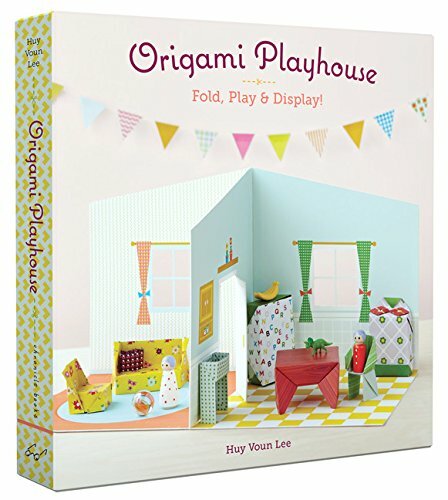 Origami Playhouse: Fold, Play & Display! Learn to make colorful furniture for the kitchen, bedroom, bathroom, living room, and dining room—all from a simple piece of paper. Create the origami décor, arrange and rearrange the rooms, and display on a desk or dresser. Hours of entertainment are just a few folds away! ‘Drawing is the cat’s meow! 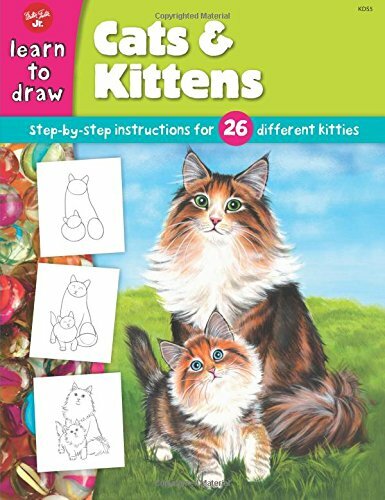 With the step-by-step, easy-to-follow instructions and full-color illustrations, any cat-lover can learn to draw 26 different lifelike kitties of all shapes and sizes. As kids follow along with the clear illustrations, they’ll learn to develop their drawings from basic shapes to finished masterpieces. And fun facts about the featured breeds add extra entertainment value. With the award-winning Cats & Kittens, kids will be drawing their own cattery full of cats and kittens in no time at all! These brightly colored stencils invite youngsters to produce their very own horse show. 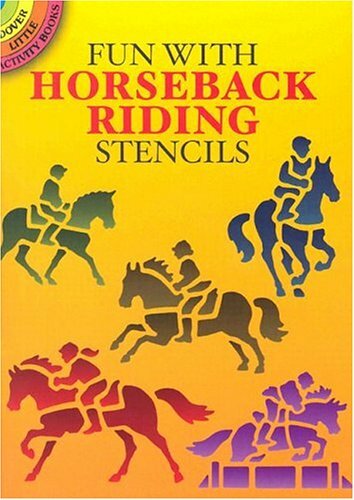 Simply trace the six open stencils to create handsome steeds and their riders — galloping, jumping hurdles, and going through their practiced paces. A touch of color adds extra dazzle to each lively mount. Craftworkers will find the stencils perfect for adding an eye-catching border to walls, furniture, and other flat surfaces. 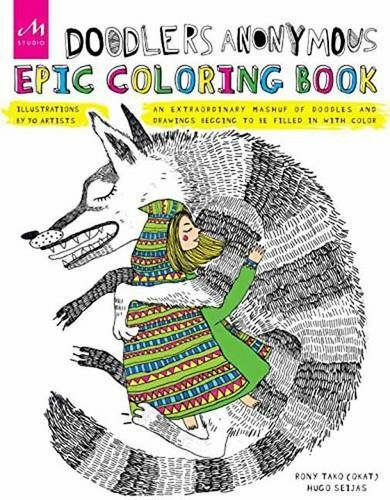 This adult coloring book is like no other. It’s a beautiful, breathing, beating, eccentric mashup of pure hand-drawn goodness. The Doodlers Anonymous Epic Coloring Book is a compilation of offbeat illustration styles by 90 global contemporary artists bound together for your coloring pleasure. Doodlers Anonymous is the preeminent online home for creative inspiration, a vast resource of unconventional illustration art, and a platform for bringing exposure to both emerging and accomplished artists worldwide. This book is made in the USA and printed on 100lb. Finch Opaque paper stock that is certified by the Sustainable Forestry Initiative. The book has printed inside covers and durable sewn binding, ensuring that the pages will lie flat for easy coloring. Crazy about Judy Moody? Or just looking for something to do? Stop dawdling—and start doodling and noodling with this RARE activity book. * and lots more wack-tivities! Ready, set, sumo! 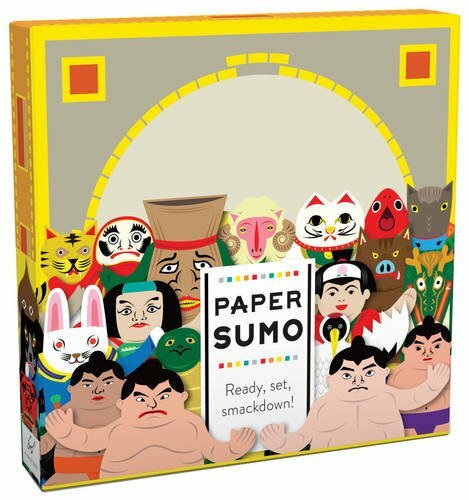 Japan’s centuries-old national sport is the main attraction in this paper-based smackdown where creativity and competition collide. The result? Laughs guaranteed! There is an impressive assortment of 39 characters—from traditional sumo wrestlers to animals to monsters and other eye-catching creatures from Japanese lore. Additional characters can be created by drawing on customizable shapes. Then battle it out against an opponent’s character on the sumo doyho ring. With each player tapping on his or her side of the doyho, the stakes are high until one of the characters falls and the other wins! 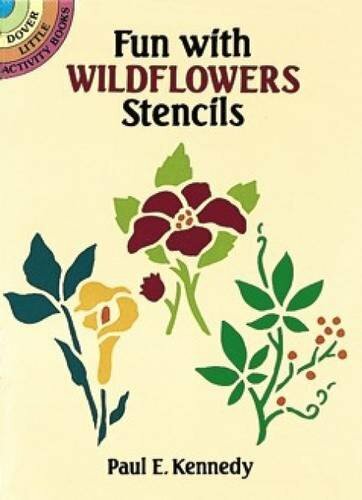 With this sturdy set of six pre-cut stencils, anyone can draw a variety of wildflowers: Bluebell, Swamp Rose Mallow, Virginia Creeper, Jack-in-the-Pulpit, Black-eyed Susan, and Lady’s Slipper. They are great for scrapbooks and other print projects — plus you can use them as attractive patterns for use in embroidery and other crafts. 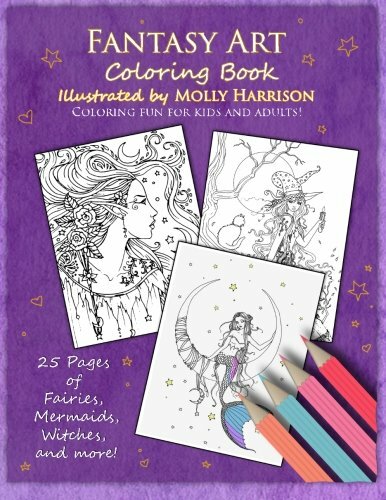 Fantasy Art Coloring Book was illustrated by artist Molly Harrison. Filled with 25 black and white illustrations of fairies, mermaids, witches, and more, it will bring coloring fun for people of all ages!